As I settle back into my role as a Barkerville street interpreter after four seasons appearing onstage at the Theatre Royal, I’ve been thinking a lot about the payoff of being a performer. The why in why we do this job. In theatre, the payoff usually follows a traditional pattern: at the end of a show the audience applauds. There is often a bit of time after each performance for actors to chat with audience members, to get immediate feedback and to answer questions, but in a traditional theatre experience both viewer and performer have a basic, unspoken agreement: I put on a show for you, you watch the show and at the end of the show your appropriate response is to clap (perhaps even stand) to demonstrate that you have appreciated the performance. With historical interpretation, the payoff presents itself in a myriad of forms – some traditional, some unusual, many unexpected. After a town tour visitors will typically applaud, but they also share stories of their travels, ask insightful questions inspired by information they have just absorbed, offer comparisons between Barkerville and the history of their own homelands, and make connections between our gold rush story and events in their own lives. There is an openness that develops between people who have shared a common experience as unique as a tour presented in role, or a complex mining demonstration presented as a simple investment rally in character by experienced historical interpreters. Whether it’s a court session with the colonial judge, or a lesson with the Victorian schoolteacher, when we take on the roles of performer and observer with no fourth wall to separate actor and audience, the real payback is what visitors tend to give back to us, the interpreters, in ways they may not even realize. Children, for example, can have such an extraordinary level of buy-in when it comes to role-playing that the payoff can be as simple as a child believing in us as our historical characters. If we say we are from another time, their wonderfully abstract minds, filled with the wide open acceptance of childhood, just believe it. In that belief, there is a specific and very gratifying kind of magic. Payoff also comes in the form of returning visitors, who bring photos and share memories from past experiences in Barkerville, where it becomes clear that the historic town has found its way into their own family lore. This week a school group from Northern BC reduced me and the woman playing Mrs. Bowron to tears when they quietly sang O Canada for us in their traditional Carrier language. They did this as a way of acknowledging the experiences that had passed between us all. Later, a woman from that same school group engaged in a long conversation with me – as my character Miss Wilson – about where we are now, globally, in the interpretation of indigenous stories in colonial-era museums. Since our interpretive model in Barkerville does not prohibit an actor from acknowledging modern ideas (provided that acknowledgement remains in role and in character) the two of us were able to really talk about this contemporary moment of deep thought about truth and reconciliation, and how it might someday manifest itself in the world of museums and heritage sites, with me switching tenses appropriately as we discussed past and “future” concepts. I can’t say that I don’t occasionally miss the immediate gratification that comes from the customary payoff at the end of a traditional theatre show, but I especially love the unexpected series of payoffs that present themselves after each and every day on the street in Barkerville. 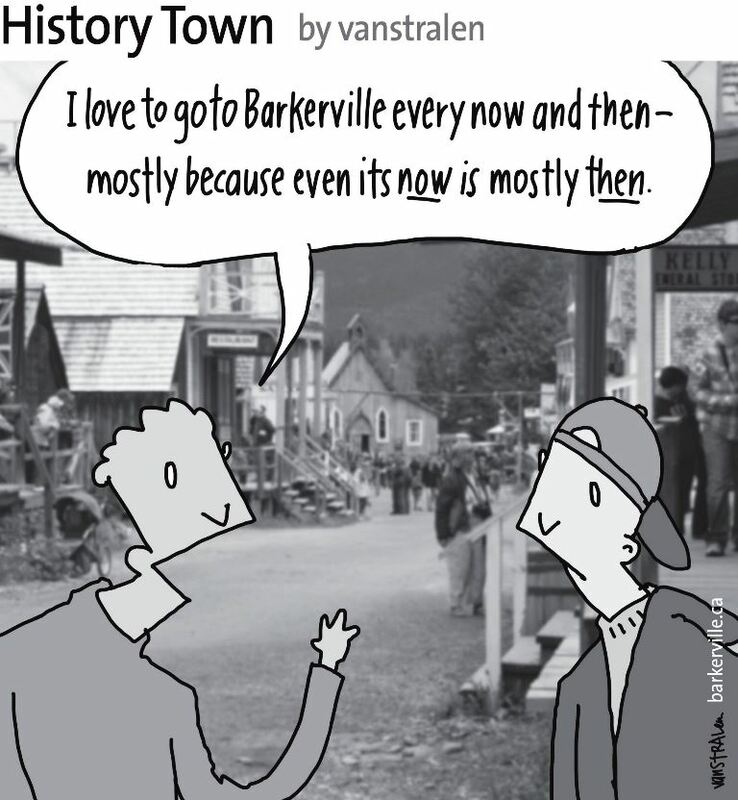 The above one-panel cartoon (originally published May 31st, 2014) by Dirk Van Stralen, with accompanying editorial by Danette Boucher, is the third of twenty weekly entries that were logged – and subsequently blogged – as part of a 2014 collaboration between Barkerville, British Columbia and the Prince George Citizen aimed at introducing some of the quirkier advantages to living, working, and playing in the Cariboo Goldfields. We hope you enjoy!